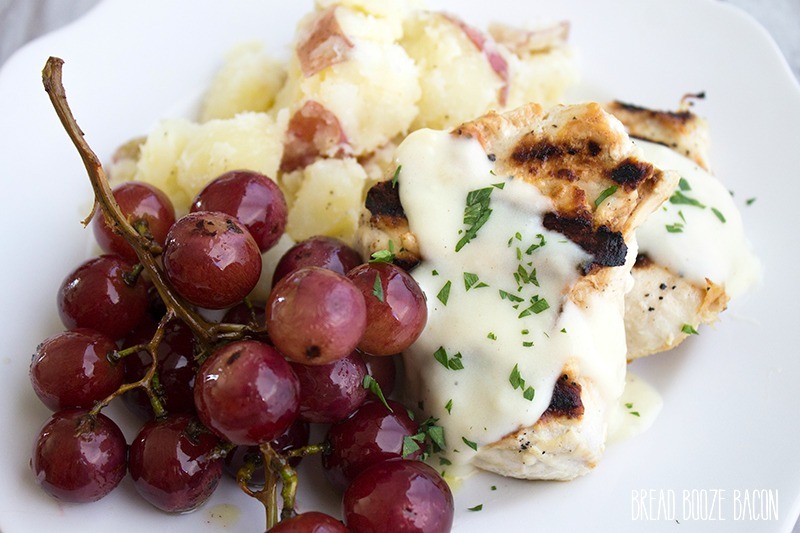 Grilled Garlic-Dijon Chicken & Grapes is easy enough for a weeknight dinner and sophisticated enough for company! It’s the best of both worlds! We’ve been grilling fools lately. Ever since Mike busted out the Weber grill he won at work we’ve been grilling practically every night of the week. It’s been great! Mike helps me cook dinner and I’m coming up with all kinds of fun things to grill! 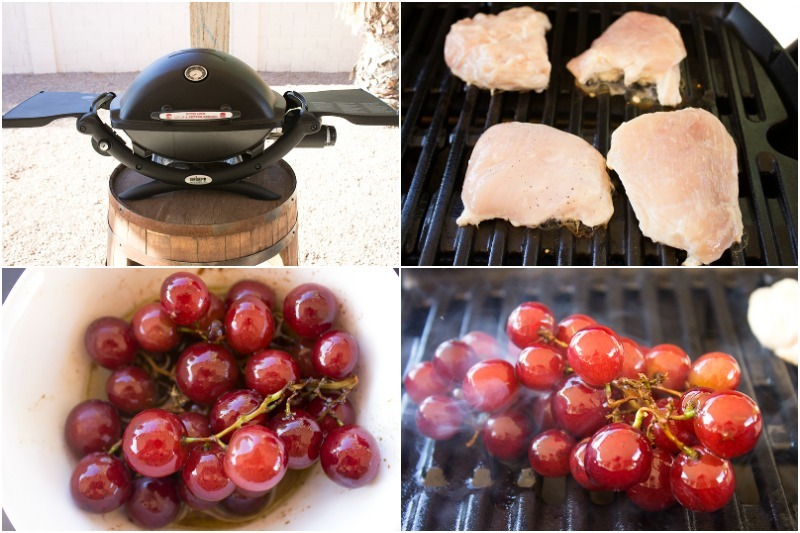 Last week I put together some garlic & dijon marinated chicken with some red grapes and oh man was it good! Mike had never had cooked grapes, but I made some for my Roasted Grape & Blue Cheese Bruschetta and they’re delicious! We even got the kids to try them. Love to grill too? You’re in luck! 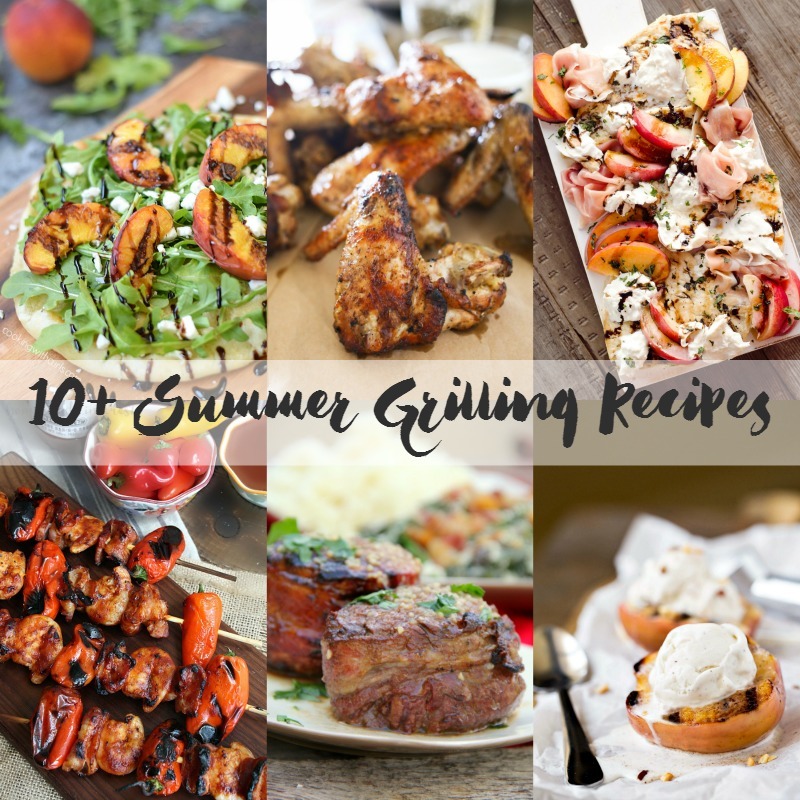 This month’s feast + devour theme is grilling and we have over 10 crave-able recipes to tantalize your taste buds and let the pyro in you do a happy dance! You can see all of the recips being shared today by clicking the links below. Grilled BBQ Bacon and Shrimp Skewers from Home.Made.Interest. 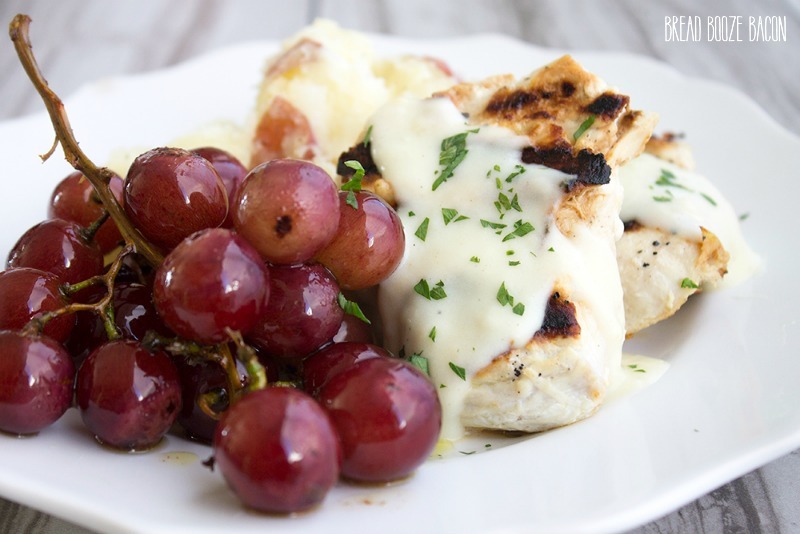 Grilled Garlic-Dijon Chicken & Grapes is easy enough for a weeknight dinner and sophisticated enough for company! It's the best of both worlds! Place the chicken breasts in a gallon-sized Ziploc bag. In a medium bowl, whisk together the dijon mustard, garlic and 1 cup of milk. Pour 1/2 cup of the milk mixture over the chicken. Seal and the bag (making sure to get the air out) and place in the fridge. Let sit for 2+ hours so the chicken can marinate. In a medium mixing bowl, whisk together the olive oil, balsamic vinegar, and garlic until well the oil and vinegar are combined. Add the grapes to the bowl and toss to coat. Preheat your medium-high heat (or get your coals ready if you're using a charcoal grill). Oil your grill. Remove the chicken from the marinade and place on the grill. Cook for 3 to 4 minutes per side or until the center is no longer pink. 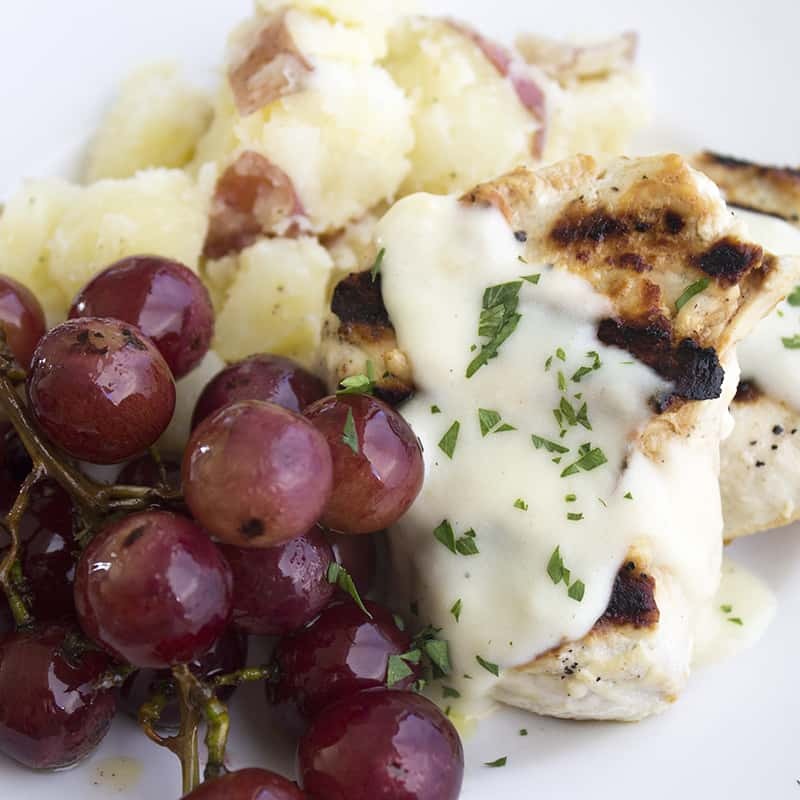 When the chicken is almost done, place the grapes on the grill. (You can separate them into 4 bunches before grilling if you prefer, or grill the big bunch at once.) Grill the grapes for 30 seconds to 1 minute per side. The grapes should have a nice sear and blister a little. 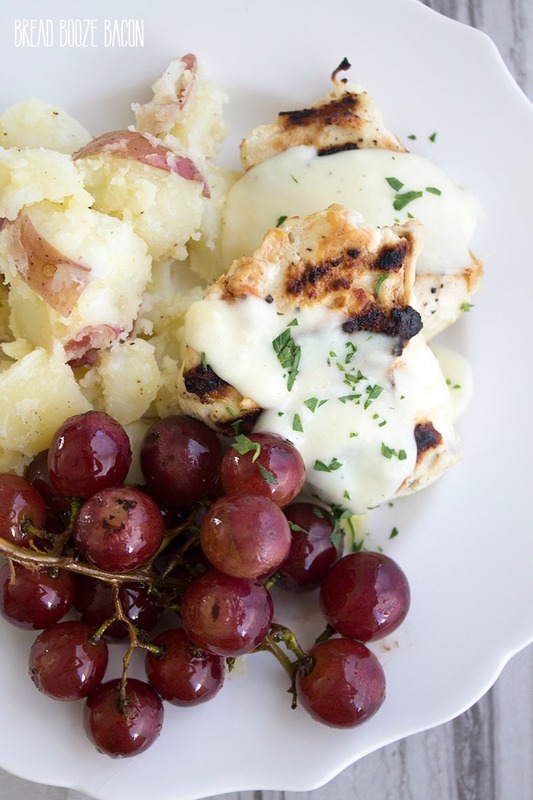 Remove the grapes and return them to the marinade bowl. Remove the chicken from the grill and loosely cover with foil. Place a medium saucepan over medium-high heat. Melt the butter, and then whisk in the flour to create a roux. Cook for 1 minute. Stir your reserved chicken marinade, and slowly whisk the marinade into the roux. Continue to cook until the sauce beings to thicken and bubble, whisking often. Plate the chicken, spoon the sauce over the chicken and sprinkle with some fresh parsley if desired. 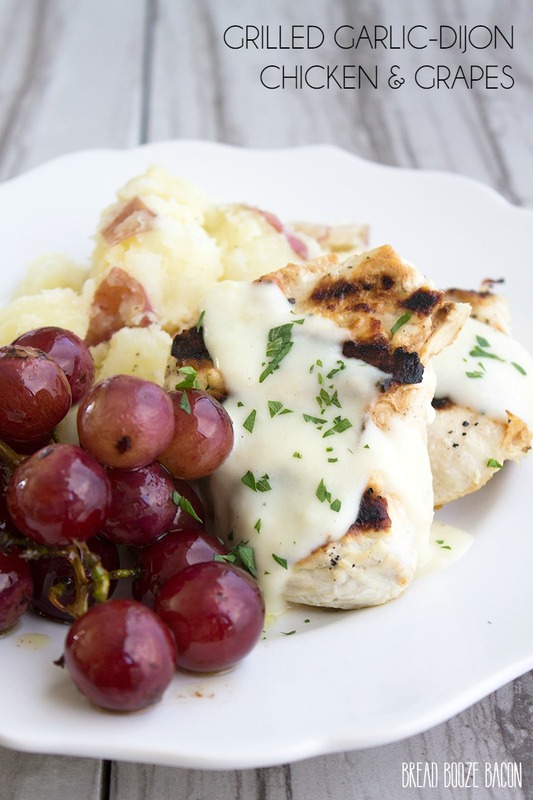 Remove the grapes from the marinade (letting the excess drop off a bit first) and plate with the chicken. Serve immediately. I pretty much always use a microplane to grate my garlic to a fine, crushed garlic texture. It distributes the garlic better and helps to make sure no one bites into a piece of garlic that might ruin the flavor. Dude! I need that grill! 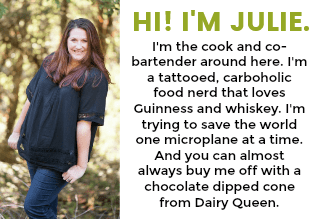 Also, your cooking grape shot is epic! Thanks dude! I love that little grill. It runs off the green propane cans you use for like camping and stuff. SUPER portable! great recipe, I love it with every bite !